Dry eyes can be a pain to live with, whether the dryness is mild or severe. 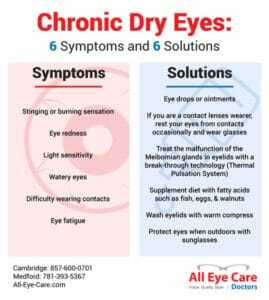 If you suffer from chronic dry eyes, make sure to get in touch with All Eye Care Doctors and schedule an appointment with one of our optometrists in Cambridge, MA or Medford, MA today. We are experts in that field and have seen and treated thousands of cases. Are you interested in scheduling a visit with an expert eye doctor in Cambridge, MA near Porter Square on the border of Somerville, MA, or in Medford, MA next to Assembly Row? Then please call All Eye Care Doctors today!